Actors, dedicate their lives to the exploration of existence. We do this in the pursuit of truth in order transform ourselves so we can illuminate all that it means to be human, moment by moment. This requires remarkable fearlessness and courage. Using the techniques of the great masters, Stanislavsky, Grotowski, Strasberg, Meisner, combined with my many years of Professional acting and teaching experience, I guide my students to access their personal truth and authenticity. Focusing on relaxation and the breath I help them take the stage with confidence in their instincts and impulses and with a fully free, improvisational quality to their work. Helping a student unlock their uniqueness and truly live moment to moment on stage or screen is the end goal. The study of acting is a life long pursuit. Each new script, each new character is another set of challenges. My students have a toolbox of skills at their disposal that support them in their exploration of any character be it contemporary, classical or avant-garde. I am the HEAD of the Master of Fine Arts Acting Department at the New School for Drama at the New School University. There I teach Contemporary Technique to the first year actors and Co-teach CO-LAB 2 in the second year; a class that combines actors, writers and directors to create new work. 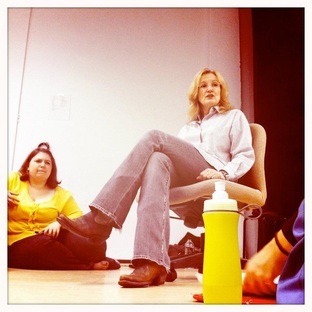 I also currently teaches a Chekhov Scene Study class at the New Studio at NYU Tisch to juniors in the BFA program.